A couple of months ago, I noticed some Twitter buzz surrounding something called the Warrior Dash. A number of Yummy Mummy Club tweeps had signed up for it so of course, I had to look into it. The Warrior Dash has been hugely popular in the U.S. and this is the first time it would take place north of the border. It's a 5k race involving several crazy obstacles including cargo nets, walls of fire and mud pits. Clearly, not your run of the mill race. Seeing as I had never trained for a race before in my life, including the time I signed up for the CIBC Run for the Cure last October, I was hesitant. But once I saw all the Warrior Moms who signed up, like Rachel, Sharon, Lisa, Joanne, Deb and Doris to name a few, I thought I would join them just for fun. I tried training but only managed getting out for a handful of runs, most of the time pushing my son in his Chariot. Zumba has also played a role in building up my cardio and endurance. But nothing could really prepare me for the steep climbs up never ending hills and slippery descents. 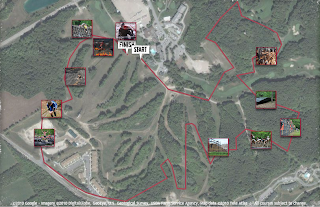 Warrior Dash Ontario took place on Saturday, July 9 at Horeshoe Valley Resort. My wave was at 3:30 so I left Toronto at around 11:45. The traffic was incredibly slow, which meant a 3 hour drive for me. I made it just in time. There were two parking lots set up with shuttle buses constantly on the run. After picking up my packet and checking in my gear, I had about 5 minutes before my wave time. Can you believe there were about 10 000 participants? The place was packed! This was taken after my run at about 4:45. Still lots of people waiting for their wave to start. Once the race began, I decided to take my time and focus on my breathing, trying to establish a pace. Near the beginning, we hit some patches of sticky mud that was hard to manoeuvre through and some people intentionally dove into it. I came out of it with mud almost up to my knees and heavy shoes. The trail took us through some short uphill climbs through the woods and over fallen trees. It was nice and shady for the most part. Our first obstacle required us to crawl through a tangled web called Arachnophobia followed by a crawl beneath a dark, covered trench. Next, we climbed over the Great Warrior Wall which I'd say was about 10 feet tall and then the Chaotic Crossover, a vertical climb along cargo nets. The obstacles gave me a chance to make up some time and, quite frankly, were the most appealing part of the race. I kind of felt like a stunt double. And then there were the steep hills. Oh, the steep hills! I had to remind myself to look only a couple feet ahead of me and focus on that. Otherwise, I would have taken a break and probably never make it all the way up. Further along, we came across more obstacles which included a mountain of straw bales, a field of tires with a scrap yard (really cool!) and the Petrifying Plunge. By the time our wave arrived at the plunge, the tarp that lined the slippery slope was worn out and had patches of holes and tears. The water had caused the soil to erode forming potholes of sorts. I nearly fell into one before sliding out of control and crashing into two people and landing on a straw bale that had been later added to prevent people from sliding further down the slope. The Cargo Climb is pretty intimidating if you're afraid of heights but I stayed focused and made it up and over without a hitch. Finally, near the end, we got to jump over two warrior fires before getting down and dirty in the mud pit. I don't know what was at the bottom of it, but something gritty did a number on my knees. Did I mention it smelled like a BBQ? I crossed the finish line 53 minutes later and ranked 524 out of 931 in the Women's 30-34 age group and enjoyed a complimentary freezing cold hose-down by a couple of firefighters. (Official results are available online.) My goal was to finish in under an hour and I did! But now, I want to try it again and aim for under 50 minutes. Yes, that's right. I want to torture myself yet again! It was just way too much fun. Plus, it was such a huge accomplishment for me and I feel so proud for having participated. Thanks to all the fellow participants from the Yummy Mummy Club and everyone else on Twitter and Facebook for their support and words of encouragement! It was so much fun, I think I'll plan my daughter's outdoor birthday party around a mini Warrior Dash theme. Wouldn't that be neat? Horned Warriors in search of their vehicles. Luckily, my ride home took only 1 1/2 hours. Why do I feel like grunting and giving you chest bump? Sounds like an absolutely amazing experience and if I can I'll do the next one with you! Great recap! This was my first Warrior Dash too and I am addicted! Congrats! What a fantastic write up :) I too am a fellow warrior. My husband, son and myself travelled 3hrs to compete in the Warrior Dash! It was the best organized event I have been to in a very long time!! I finshed 449/751 in the 35-40 females, this being my first time to do anything like this I am proud to have finshed :D. Never did I think it was going to be so much fun! We will definatly be going next year, cant wait! Congrats to my fellow warriors! Glad to hear you enjoyed it as much as I did. Can't wait for Warrior Dash 2012! Thanks, ladies! The uphill climbs were definitely a challenge, much harder than the obstacles themselves.